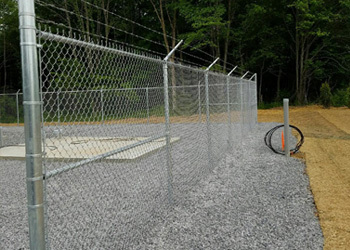 Installing a Security Fence | Pittsburgh Fence Co, Inc. Installing a Security Fence – Pittsburgh Fence Co, Inc. Adding a security fence to your property will give you peace of mind and boost the value of your home or business while adding an attractive element to your yard. Installing a fence should be a long-term investment, so be sure to choose one that is durable, fairly maintenance-free and one that will compliment your home and neighborhood. Before the winter descends upon us, The Pittsburgh Fence Company shares their expert advice on installing a security fence and why it’s never too late to think about adding one. To begin, lets discuss the various types of fences out there and how they provide an added level of security to your property. Vinyl. Vinyl fencing is made of PVC and is incredibly durable, will withstand the elements and requires little to no maintenance. They’re fade resistant and will not rot. They are easy to install, long-lasting and will provide a barrier wall that is not only secure, but impenetrable to the eye. Wood. Wood fencing is very attractive and traditional and certain styles like vinyl, not only offer security, they keep wandering eyes off property. It however does require maintenance as the suns UV-rays may cause them to fade and poor lawn drainage may cause it to rot. These reasons should not deter you from installing one, rather you should consider the size of the yard you are fencing in. Wood fences are great for smaller yards as maintenance is much more manageable than one surrounding a larger yard – unless of course you are willing to spend the money for yearly maintenance. If you think about it, there really is nothing quainter than a wooden fence! Aluminum. In this article, we’re focusing on the aluminum fencing that mimics the prestigious wrought iron styles of the past. While these aren’t totally see-through, they still add security to your home without completely shutting you off from the outside world. These fences are often considered decorative. Protection. Depending on where you live, there is always a reason to install a protective barrier around your home. Our unique Western Pennsylvania landscape means you very well may live in wooded area even though your minutes away from commercial shopping. A wooded landscape lends itself to roaming wildlife like deer, fox and even bears that may unknowingly threaten your flower and vegetable gardens or even harm your children and pets. On another hand, you may live in an area that has the potential for crime. Adding a fence to either landscape will offer a layer of protection from any intruders. Marking your property. Stop relying solely on property pins or land surveys to define your property lines. Installing a fence around your lot will help deter neighbors encroaching onto your property and will better avoid property disputes. Ever wonder who owns the pine tree at the edge of your property line? Install a fence and you’ll be sure to find out. Security. If you have dogs, children, or a pool, it’s a good idea to secure your perimeter with a fence. If you have a dog that likes to run off the leash or you have kids at an age you can trust to play in your backyard partially unattended, there is nothing better than knowing they aren’t going to run off into the street or that anyone is going to pose a threat to entering your property. If you own a pool, it’s good-practice to install a fence. In fact, most cities and boroughs require one. Pools are fun, but things can go south very quickly if you don’t have a fence keeping young children, pets and even neighbors from entering unsupervised. Prevent tragedy, always install a security fence around your swimming pool. Decorative Fences. Some fences are more decorative than others. Aluminum fencing, or those that mimic wrought iron fencing, beautiful choices and can increase the value of your home. If you want to add elegance and security without shutting off your yard from the outside world, choose from various aluminum fences like those with ornate picket styles or stately smooth top rails. A fence is a warning sign that conveys the message: Do not enter! A security fence will give you peace of mind while boosting the value of your home, making it more marketable especially if you live in wooded area, live in neighborhood that may have a high crime rate, or own a pool. Remember, if you live in a neighborhood development you’ll want to ensure you check any rules that come with installing fences as there may be specific styles and materials you’ll have to choose from. Call Pittsburgh Fence Company at one our 4 locations!